Yesterday I presented a talk at ICT Conference for Schools, in Southampton. We're (hopefully) going to be presenting something similar in Boston this summer. I thought it would be good to just summarise it here, and post the code examples I showed. Banana Physics starts with the Banana Piano - the classic Makey Makey project... or should I say the ONLY Makey Makey project. Despite their claim its an "invention kit" which can "make anything", their idea of "anything" is rather limited to being a keyboard made out of fruit! More or less any fruit you'd like! Except they basically don't. To understand we need to investigate RESISTANCE. If we use a pico board, instead or a makey makey we can actually do science! This is the circuit that the pico board (and pretty much everything else) uses to attach your banana to the computer. R1=10K, and the banana replaces R2. With a bit of good old school Ohm's law, we can write an equation to calculate R. It turns out the Banana's have a resistance of around 40K-50K ohms. Not good conductors at all. The next step is to drop a thermistor in place of R2. With a bit more complex maths, we can turn that resistance into a pretty accurate temperature (or up to 4 different temperatures on the different channels). It's pretty easy to log that data over time. On the one hand Picoboards aren't cheap (about £30 in the UK), that's really nothing compared what you'd pay for a 4 channel data logger, or even a good multimeter. We then switch out the thermistor for a light dependant resistor. We could track light levels, but we can also use it to detect an object moving in front of the sensor. We set up two about 70cm apart, and time a beanbag to fall from the top one to the bottom one. Applying kinetic equations we know starting speed (0m/s), distance (0.7m), and we measure time. Which allows us to calculate acceleration - gravity. Alternatively we can use the Lego Wedo... Two distance sensors make a great speed trap, so we can measure the speed of an object. If we drop the beanbag 70cm, and measure its final speed, kinetic equations will give us gravity again. In the talk I just did a very casual demo, and dropped it from a very rough distance, and it came up with a value of 8.5m/s/s. Pretty good. The final demo was using the wedo tilt to measure the period of a pendulum. Again putting together a bit of maths/physics, and coding I got a value of 10.5 this time. Again, this is pretty good for a guy standing in a room with a laptop and a few bits of Lego. Here's the code I used for the demos. Check out the "Science" tag on my blog posts, to get more detail on these projects (perhaps built with different hardware), and ideas for other code based science. The point of the talk was (in addition to promoting Sniff! ), to show how using coding and making you can make high school science really fun. If coding is writing, then the whole point of learning to code is to unlock new ways of expressing and exploring. If coding just lives in the ICT class then its a total waste of time. If it lets you explore and understand the universe better, then that's pretty amazing. So far I'm very skeptical about the Wedo 2.0. It's yet another lego electrical plug standard that's incompatible with both the existing Wedo/PF range or the EV3. That means not only do we have to buy new motors and sensors but we have only two sensors and one motor (where as Wedo 1 can use st least use several motor types, the servo, and lights). The argument that the new plug will by more versatile and flexible is exactly the argument that was used when the Wedo/PF plug replaced the older Lego 9V system, but in practise there were less components produced for PF than for the 9V system. In fact looking back at the Lego 9V/RCX system, it seems the most complete, and well thought out of the many the different (incompatible) Lego electrical systems. While it is a bit limited, and in theory the more modern systems should have a technical advantage the older and simpler system has one fantastic thing in its favour: compatibility. 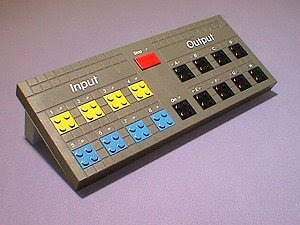 While currently lego uses one plug for its technics range (Power Functions) another for Wedo 2.0, and a third for EV3, the older system used the same plug for all its products, so technics users could add an RCX controller. Even when NXT (and subsequently EV3) was introduced an adapter cable allowed 9v/RCX sensors to be used. Even today the Power Functions extension cable allows 9V motors to be used (and PF motors to work with 9V controllers). The old 9V plugs were also simple: a positive and negative terminal which could either provide power, or be connected to a resistive sensor. With a bit of cleverness, they could be persuaded to do both at the same time, so powered sensors were possible. Putting the same system in the hands of the public, and educators led to an explosion of creativity (that neither the Wedo or the Microbit are able to enjoy!). Look at that thing and ask yourself what more you could ask for from a system. 8 inputs, 8 outputs, connected via a serial port (so no drivers needed). Compatable with a wide range of cheap sensors. You'd need 8 wedo to do the same job! It was released in 1995, and its bigger and better than anything available now. As for what you could attach, there were a choice of motors in various sizes, various types of lights, two different sirens, a light sensor, a rotation sensor, a button, and temperature sensor. The light sensor is actually very similar to the Wedo distance sensor (though not quite as robust), but the rotation sensor leaves the Wedo Tilt in the dust - It can measure angles of rotation in 22.5 degree steps, which compared to the Tilt's forward/backwards just shows how much we've dumbed down! We were able to pick up one of these, and a whole load of sensors for less than half the price of a Wedo set. We also got some PF extension cables so we can use our existing PF motors (or hack them up to make new sensors!). If you have the original cables and PSU then great, but if they've gone missing, the PSU is 10V AC, 7VA. Note that this is an AC-AC transformer, so most PSU's won't work. You see serial cables were designed to connect computers to modems. Modems would talk over a phone line to the another Modem, which would then have another serial cable to a computer. The Modems just passed the message along, so were called Data Communications Equipment (DCE), while computers were at the ends of the signal path, so were called Data Terminal Equipment (DTE). Now if you've ever encountered a pin on a circuit board marked "TX" you'll know the dilemma - is this the pin that the board is transmitting on (so you connect it to your RX) or is it the pin that you should use to transmit, so connect it to your TX. Well with DTE and DCE its really easy: DTE is "in charge", so TX on DTE is an output, and TX on DCE is an input. But what if I'm not talking to a modem? I'm talking to an I/O board here... They should both be DTE? Well the "correct" thing to do is to use "null-modem". In theory thats a small box that has a DCE socket on each side. You connect each piece of DTE equipment to the Null Modem and the null modem crosses over the RX and TX wires. which is exactly what Lego have done... They've put a female (DCE) connector on the box, so you need a male-female cable, but they've wired it as DTE. That means you need a M-F DB9 null modem cable!!! They do exist and you can get them cheaply on eBay, but they're not the sort of cable you're likely to have in your bits box. Between the odd PSU and odd serial cable I hate to think how many of these gems have been thrown away as "not working", when they just need hooked up properly. With that in place, you'll probably need a USB-Serial converter - any with a DB9 connector on will do. While using old school serial might seem tedious compared to USB, the benefit is that we're now good to go - no drivers, or difficult code to write. Just send some text and it works. Even when you get everything hooked up, you still need the right software to get the thing to jump into life. I spend some time wondering if mine was broken, before getting it working reliably. Plug it all together and fire up Sniff, release 25 or later. It should find the serial port (it'll call it an Arduino, but it calls everything an Arduino!). If you're on Windows you'll need to set ARDUINODEV to be the com port you're using. The example files are in examples/Hosted/dacta/test. To control a motor, the first thing we need is a dacta device. the variable legoValue is used to communicate with modules. We then create a motor device on port 1. To set its speed, just set legoValue and tell the motor to update. If your familiar with the old Wedo Sniff API then you can also communicate with a specific port by using the legoConnector variable, but the new style API is nicer. The Wedo also can use this new Object based style (check the examples). Interestingly the lego "Touch" sensors are actually analog, and can report the strength of the push rather than just being on or off. The dactaLight, dactaTemperature and dactaRotation devices work in exactly the same way, returning a value whenever you call "update". somewhere in your program, and it will just keep the board alive. The Wedo 1 is a great device, the Wedo 2 maybe in the future, but the Control Lab B is really the Mother of all Wedo! It's an amazing device, and its a shame that we can't have something quite as cool available today. Release 25 if Sniff is now with us, and brings the usuall cornucopia of goodies. A big call out, and thanks to Robin Newman for his help it getting the Flotilla support close to complete. The new release is more stable, and supports the changes made to the Flotilla in in its "shipshape" update/pre-release - make sure your FW is updated to this. We've were unable to test the full Flotilla system "in-house" as we only had access to a small number of the modules. Robin's done a great job testing the code (often long before we got close to making it work), bug fixing, and demoing the system. The Motion module is the one outstanding thing to build and we'll have that going in the next few weeks. We also 'discovered' the Lego/Dacta 9751 Control Lab B... and just had to get hold of one, and add Sniff support. These are about 20 years old and are one of the first Lego/Computer systems. Look at what they had available then, and what they have now, someone is clearly going in the wrong direction - 8 inputs & 8 outputs, easily controlled from a computer without any complex drivers or installs needed - that's like 8 Wedos in one box! There are more (and better) sensors available than the Wedo, and you can pick them up super cheap second hand. I hate to think how many of these have been thrown away when someone couldn't get the SW to work, or because they're just "old". Grab em while you can! As we were building the SW for the Control Lab, we looked at what we'd learnt developing for Flotilla, and built a more "object oriented" interface to it, than we had for the Wedo. So then we went back and re-worked the Wedo to support the new way of talking to this hardware. You can code for Control Lab or Wedo using either the old Connector based numbering system or using the new method. We've updated SniffPad so that it now does basic keyword highlighting, and formats text a little nicer, so you can see what's going on in your code so much better. On other minor thing you might need to know... To make the Pi versions easier to work with we've moved the GPIO support from the "sniff" command. Compiling on Pi with the command "sniff" just generates a regular executable. This means you don't need to run it as root. To access the gpio you can compile with the pi-sniff command.